African Crowned Eagles are listed as near-threatened on the IUCN redlist, with a decreasing population trend. This species has therefore been identified as a species of special concern by SANParks. Nests falling within the Garden Route National Park were previously monitored since 1983, with the last known active nest found in 2007. Since then, these nests have had no activity. Because Crowned Eagles are strongly territorial and usually maintain these territories throughout their breeding cycle (usually lasting up to about 500 days), it is worrying as to why these previously active nests were abandoned. We are looking for any reports of African Crowned Eagle sightings, especially within the southern Cape where populations have declined. Any additional details like breeding pairs, juvenile or nest location (if seen) would be greatly appreciated. 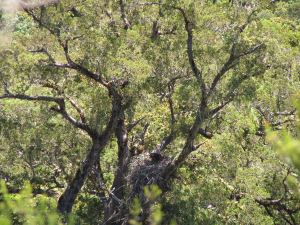 Previously monitored nests in GRNP were found in Kalander trees (Outeniqua Yellowwood) but they have also been seen nesting in Eucalyptus trees in Kwazulu Natal and other parts of Africa.